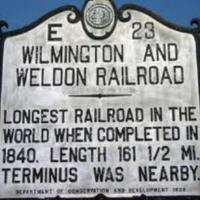 Joseph Hoyle wrote to his wife to notify her that they had changed positions again, this time near Petersburg and the Weldon Rail Road. He told her how the dry and hot weather was taking a toll on the men. He had heard that there are Union forces near where his wife was living and he told her that if that was true they all must act like soldiers. He closed the letter by telling her how he had seen one of his relatives and heard from one of her brothers. Jeffrey M. Girvan, ed., Deliver Us from this Cruel War: The Civil War Letters of Lieutenant Joseph J. Hoyle, 55th North Carolina Infantry (Jefferson, NC: McFarland and Company, 2010), 182-183.
line through open fields exposed to the sun. And when we march, the dust is excessively hard on us. I do hope, and pray, this hard campaign will soon end, and with it this cruel war also. And I must say that I now look forward to the future with some emotions of encouragement and renewed hope. I have just heard that the yankees have been in Morganton, and at Camp Vance. I do not know whether it is true or not, but if the yankees get among you up there, you must all act the part of soldiers, and they will not find it convenient to stay with you long. Let us be patient, and trust a just and merciful God for the issue and our deliverence will come. I saw W. B. Hoyle yesturday safe and well. I received a letter from W. R. Self bearing date of the 27th inst. He was then at Stanton, and well. My respects to all â€” As ever, yours in hope & love. Hoyle, Joseph J., Letter of Joseph J. Hoyle to Sarah Hoyle, July 5, 1864, Civil War Era NC, accessed April 24, 2019, https://cwnc.omeka.chass.ncsu.edu/items/show/691.